As a dietary supplement, take 3 capsules twice daily. Always consume with at least 16oz. of water. Non Workout Days: Take one serving with your first meal. Take another serving with a meal 4-6 hours later. As a dietary supplement, take three (3) capsules twice daily. Always consume with at least 16oz of water. Workout Days: Take one serving 30 minutes prior to training. Take another serving immediately following training. Creatine ethyl ester, also known as creatine ester, cre-ester and CEE, is a creatine developed for athletic performance and for muscle development in the body. It is an ethyl ester derivative of creatine, from which it is made. As a supplement, the compound was developed, patented and licensed through UNeMed, the technology transfer entity of the University of Nebraska Medical Center. 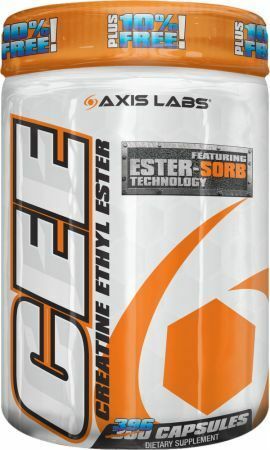 Axis Labs acquired licensing rights under the University's worldwide patent portfolio directed to creatine ethyl ester as a nutritional supplement. The patented technology was developed at the University by faculty member Dr. Jonathan Vennerstrom, a Professor and the Interim Chair of Pharmaceutical Sciences at the University, and former faculty member Dr. Donald Miller, now an Associate Professor with the Department of Pharmacology & Therapeutics at the University of Manitoba. Acosta, E. P. and C. V. Fletcher (1997). Valacyclovir. Ann Pharmacother 31(2): 185-91. Anomasiri, W., S. Sanguanrungsirikul, et al. 2004. Low dose creatine supplementation enhances sprint phase of 400 meters swimming performance. J Med Assoc Thai 87 Suppl 2: S228-32. Beaumont, K., R. Webster, I. Gardner and K. Dack (2003). Design of ester prodrugs to enhance oral absorption of poorly permeable compounds: challenges to the discovery scientist. Curr Drug Metab 4(6): 461-85. Brudnak, M. A. 2004. Creatine: are the benefits worth the risk? Toxicol Lett 150(1): 123-30. Chang, Y., Kang, S., Ko, S., Park, W. (2006). Pretreatment with N-nitro-L-arginine methyl ester improved oxygenation after inhalation of nitic oxide in newborn piglets with Escherichia coli pneumonia and sepsis. J Korean Medical Science 21: 965-72. De Clercq, E. and H. J. Field (2006). Antiviral prodrugs - the development of successful prodrug strategies for antiviral chemotherapy. Br J Pharmacol 147(1): 1-11. Dempsey, R. L., M. F. Mazzone, et al. 2002. Does oral creatine supplementation improve strength? A meta-analysis. J Fam Pract 51(11): 945-51. Eksborg, S., N. Pal, M. Kalin, C. Palm and S. Soderhall (2002). Pharmacokinetics of acyclovir in immunocompromized children with leukopenia and mucositis after chemotherapy: can intravenous acyclovir be substituted by oral valacyclovir? Med Pediatr Oncol 38(4): 240-6. Falk, D. J., K. A. Heelan, et al. 2003. Effects of effervescent creatine, ribose, and glutamine supplementation on muscular strength, muscular endurance, and body composition. J Strength Cond Res 17(4): 810-6. Feldman, E. B. 1999. Creatine: a dietary supplement and ergogenic aid. Nutr Rev 57(2): 45-50. Froiland, K., W. Koszewski, et al. 2004. Nutritional supplement use among college athletes and their sources of information. Int J Sport Nutr Exerc Metab 14(1): 104-20. Greenwood, M., J. Farris, et al. 2000. Creatine supplementation patterns and perceived effects in select division I collegiate athletes. Clin J Sport Med 10(3): 191-4. Han, H., R. L. de Vrueh, J. K. Rhie, K. M. Covitz, P. L. Smith, C. P. Lee, D. M. Oh, W. Sadee and G. L. Amidon (1998). 5'-Amino acid esters of antiviral nucleosides, acyclovir, and AZT are absorbed by the intestinal PEPT1 peptide transporter. Pharm Res 15(8): 1154-9. Han, H. K., D. M. Oh and G. L. Amidon (1998). Cellular uptake mechanism of amino acid ester prodrugs in Caco-2/hPEPT1 cells overexpressing a human peptide transporter. Pharm Res 15(9): 1382-6. Hoffman, J. R., J. R. Stout, et al. 2005. Effect of low-dose, short-duration creatine supplementation on anaerobic exercise performance. J Strength Cond Res 19(2): 260-4. Huang, S. H., K. Johnson, et al. 2006. The use of dietary supplements and medications by Canadian athletes at the Atlanta and Sydney Olympic Games. Clin J Sport Med 16(1): 27-33. Jonas, A. J. and I. J. Butler (1989). Circumvention of defective neutral amino acid transport in Hartnup disease using tryptophan ethyl ester. J Clin Invest 84(1): 200-4. Javierre, C., J. R. Barbany, et al. 2004. Creatine supplementation and performance in 6 consecutive 60 meter sprints. J Physiol Biochem 60(4): 265-71. Kim, D. K., N. Lee, H. T. Kim, G. J. Im and K. H. Kim (1999). Synthesis and evaluation of 2-amino-6-fluoro-9-(4-hydroxy-3-hydroxymethylbut-1-yl)purine mono- and diesters as potential prodrugs of penciclovir. Bioorg Med Chem 7(3): 565-70. Kim, D. K., N. Lee, Y. W. Kim, K. Chang, G. J. Im, W. S. Choi and K. H. Kim (1999). Synthesis and evaluation of amino acid esters of 6-deoxypenciclovir as potential prodrugs of penciclovir. Bioorg Med Chem 7(2): 419-24. Kocak, S. and U. Karli. 2003. Effects of high dose oral creatine supplementation on anaerobic capacity of elite wrestlers. J Sports Med Phys Fitness 43(4): 488-92. Kraemer, W. J. and J. S. Volek. 1999. Creatine supplementation. Its role in human performance. Clin Sports Med 18(3): 651-66, ix. Kreider, R. B. 2003. Effects of creatine supplementation on performance and training adaptations. Mol Cell Biochem 244(1-2): 89-94. LaBotz, M. and B. W. Smith. 1999. Creatine supplement use in an NCAA Division I athletic program. Clin J Sport Med 9(3): 167-9. Lunardi, G., A. Parodi, et al. 2006. The creatine transporter mediates the uptake of creatine by brain tissue, but not the uptake of two creatine-derived compounds. Neuroscience 142(4): 991-7. McGuine, T. A., J. C. Sullivan, et al. 2002. Creatine supplementation in Wisconsin high school athletes. Wmj 101(2): 25-30. McGuine, T. A., J. C. Sullivan, et al. 2001. Creatine supplementation in high school football players. Clin J Sport Med 11(4): 247-53. Mendes, R. R., I. Pires, et al. 2004. Effects of creatine supplementation on the performance and body composition of competitive swimmers. J Nutr Biochem 15(8): 473-8. Mendes, R. R. and J. Tirapegui. 2002. [Creatine: the nutritional supplement for exercise - current concepts]. Arch Latinoam Nutr 52(2): 117-27. Metzl, J. D., E. Small, et al. 2001. Creatine use among young athletes. Pediatrics 108(2): 421-5. Mizen, L. and G. Burton (1998). The use of esters as prodrugs for oral delivery of beta-lactam antibiotics. Pharm Biotechnol 11: 345-65. Morrison, L. J., F. Gizis, et al. 2004. Prevalent use of dietary supplements among people who exercise at a commercial gym. Int J Sport Nutr Exerc Metab 14(4): 481-92. Okudaira, N., T. Tatebayashi, G. C. Speirs, I. Komiya and Y. Sugiyama (2000). A study of the intestinal absorption of an ester-type prodrug, ME3229, in rats: active efflux transport as a cause of poor bioavailability of the active drug. J Pharmacol Exp Ther 294(2): 580-7. Ostojic, S. M. 2004. Creatine supplementation in young soccer players. Int J Sport Nutr Exerc Metab 14(1): 95-103. Poortmans, J. R. and M. Francaux. 2000. Adverse effects of creatine supplementation: fact or fiction? Sports Med 30(3): 155-70. Rawson, E. S. and J. S. Volek. 2003. Effects of creatine supplementation and resistance training on muscle strength and weightlifting performance. J Strength Cond Res 17(4): 822-31. Reeves, J. P. (1979). Accumulation of amino acids by lysosomes incubated with amino acid methyl esters. J Biol Chem 254(18): 8914-21. Reeves, J. P. and T. Reames (1981). ATP stimulates amino acid accumulation by lysosomes incubated with amino acid methyl esters. Evidence for a lysosomal proton pump. J Biol Chem 256(12): 6047-53. Sawada, K., T. Terada, H. Saito, Y. Hashimoto and K. I. Inui (1999). Recognition of L-amino acid ester compounds by rat peptide transporters PEPT1 and PEPT2. J Pharmacol Exp Ther 291(2): 705-9. Silber, M. L. 1999. Scientific facts behind creatine monohydrate as sport nutrition supplement. J Sports Med Phys Fitness 39(3): 179-88. Tarnopolsky, M. A., G. Parise, et al. 2001. Creatine-dextrose and protein-dextrose induce similar strength gains during training. Med Sci Sports Exerc 33(12): 2044-52. Volek, J. S., N. D. Duncan, et al. 2000. No effect of heavy resistance training and creatine supplementation on blood lipids. Int J Sport Nutr Exerc Metab 10(2): 144-56. Wellner, V. P., M. E. Anderson, R. N. Puri, G. L. Jensen and A. Meister (1984). Radioprotection by glutathione ester: transport of glutathione ester into human lymphoid cells and fibroblasts. Proc Natl Acad Sci U S A 81(15): 4732-5.